As the third daughter in a family of nine, growing up in Greece during World War II is tough, but not as tough as it is for many of Tita’s neighbors. Bombs destroy the house next door to their family bakery. German and Italian soldiers occupying the island conscript her father to bake bread for them. Convincing them he needs helpers for the task at hand, he brings all 46 members of his extended family to work in the bakery. Besides not knowing what it takes to produce said bread, the soldiers don’t really know how many loaves 100 kgs of flour makes, either…let’s just say no one goes hungry. However, things eventually get so miserable that Tita’s fellow townsfolk start offering her father the deeds to their homes for a few loaves of bread – something he steadfastly refuses, instead feeding them from the bounty of the occupiers’ unknown stash. Eventually, he is caught and beaten for distributing bread to non-military personnel. With war raging, the family flees via boat to a refugee camp in Egypt. On day one, her father waits in line for hours and is given only lentils to feed his family. They aren’t clean and he worries for his family’s health. On day two, he disappears and is gone for three days, returning with camels laden with foodstuffs, most of which he sells in order to feed his family. Tita’s mother makes clothing from blankets and cloth and sells that as well. This continues through war’s end, when they return to Kalymnos with quite a bit more money than they had when they left. When her mother becomes ill, Tita quits school at age 14 and spends several years working in the bakery. It’s here that Tita, later known in these parts as “cool Yaiyia” (grandmother), learns how to bake. Her pastries become legendary and are lovingly rumored to be descended from Olympus, or at the very least, Kalymnos. One day Tita’s parents tell her to go home from the bakery, get cleaned up and put on her best clothes. Little does she know that she’s to meet her new fiancé that evening. The arranged marriage takes place just two weeks later. Her husband’s people were prominent sponging fishermen in Greece. The U.S. government had brought them to the States in the 1930s to help start the sponge industry in Tarpon Springs, Florida. In the late ‘40s the industry suffered a series of setbacks – a red tide devastated the sponge beds, and then, the advent of synthetic sponges drove down demand. They lost everything, and, like many Greeks at the time, they immigrated to the Gary, Indiana region to work in the mills. Antony Zervos was a child of the above conditions. A first-generation American of Greek-born parents, he’d come to Greece to find a Kalymnian wife. With a cousin squiring him about, they search for eligible young women. Spying Tita in the bakery, Antony goes in and buys some bread. Smitten, he tells his aunt, who plays matchmaker and seals the deal. Following a short honeymoon in the islands, Antony returns to America to await his bride, whose immigration paperwork will take a few months to get in order. Once in hand, Tita, the now 20-year-old newlywed, travels on a ship to New York, alone, not knowing a word of English. Upon her arrival, the enormity of the situation hits her. By using her grade-school French to read the letters that mean nothing to her, she begins learning the new language. Remember, Greek is another alphabet and French ain’t English. Watching “Sesame Street” helps as well. On the train trip from New York to her new home just outside of Chicago, Tita realizes things may not play out the way she once envisioned. The White House or a Hollywood mansion probably won’t be the fate of the wife of an iron worker (Local 395) living in Merrillville, Indiana. There will be no president or movie stars, and her dream now seems even further away than Kalymnos. Tita considers going back, but life intervenes. Instead, she finds herself staying in the U.S. and raising a family of five. As the old saying goes: “Man plans, god laughs.” Or in this case, woman. Being caught between the intersection of culture shock and memories makes life all the more challenging. In order to survive, a form of cultural osmosis must take place – history and the present meet in the middle and create a personal evolution. Old and new worlds collide. On American soil during the 1960s, Tita 2.0 begins to take shape. When her husband tries teaching her to drive, he ends up jumping from the car, afraid. Undaunted, Tita continues cruising around for three more hours, unaware that there’s even a gear for reverse. She tells me she simply went straight or drove in circles. Then there’s the time, she says with an impish grin, she cut her hair, which in the old country is traditionally worn long. Her father-in-law and husband both flipped very much the f*ck out, which was too bad for them. Her hair remains short even now. She came out of her self-imposed retirement because she craved certain foods prepared a certain way – the way only she could make them. Before long, the grandkids started making requests, saying, “Mom can’t make it as well as you do,” and next thing you know, Yiayia is back riding the range. The best part about writing this series is that I get to eat all this fantastic food I’ve been writing about. 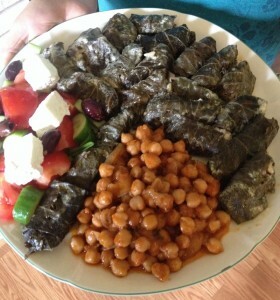 It smells sensational as we sit to sample the garbanzo beans and stuffed grape leaves she’s been cooking all morning. 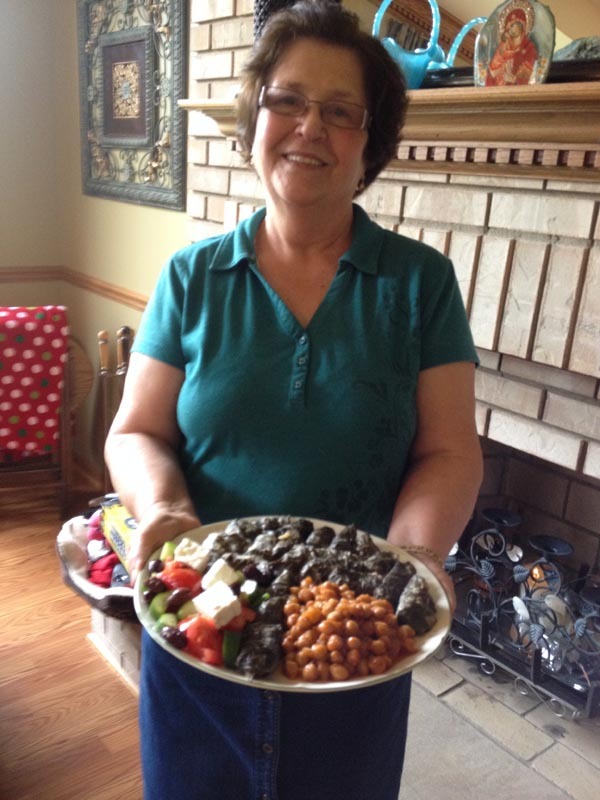 Yiayia Tita tells me she likes simple flavors with fresh ingredients that don’t disguise the taste of the food. 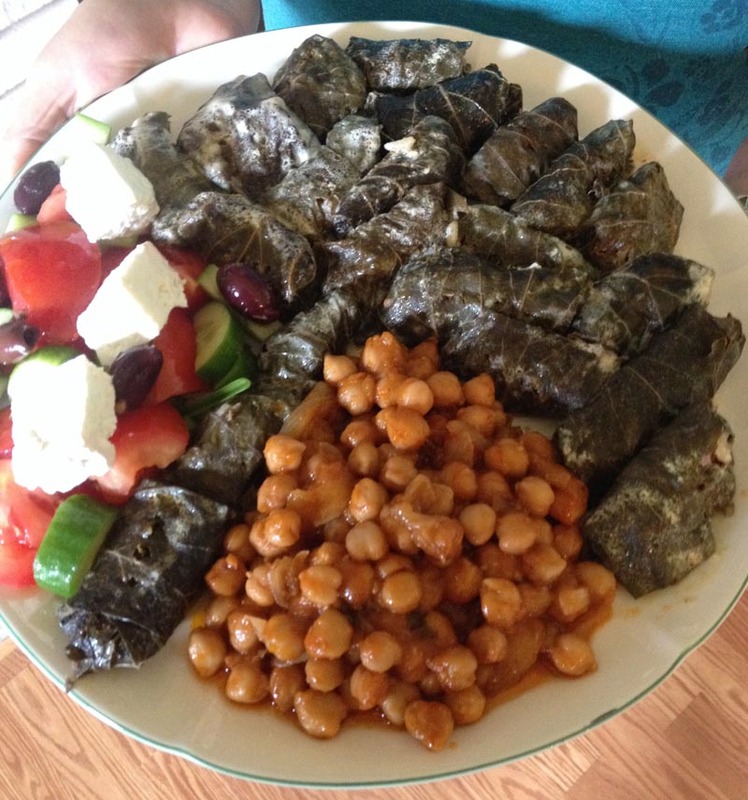 “You find the freshest, the best, and just make it as good as you can and that’s it – you don’t need extra (laughs)…Well, maybe some tomatoes, some feta, some olives.” That said, even Yiayia admits to a fondness for canned garbanzo beans and bouillon cubes- something unthinkable back on Kalymnos. Tita tells me her kids and grandkids don’t share her enthusiasm for feeding the family and cooking the old way; considering it too time-consuming and labor-intensive for their busy American lives. However, the kids disagree, arguing that when they request a certain dish, they often end up helping her which, if you ask Yiayia, is exactly as it should be. That is how knowledge and tradition get passed down generations in the first place. It’s said that it takes three generations to go from the delicious stew of a melting pot, to that of bland cultural assimilation, so unfortunately, she’s probably right. Alan Lake a.k.a. “Jazzfood” a.k.a. “The Garlic Chef” has been a globetrotting professional chef for three decades and has won numerous awards, professional competitions and distinctions. He’s also the author of The Garlic Manifesto, a book about the history of garlic going back to 10,000-year-old Neolithic caves that contains facts, fiction, folklore, artwork, recipes, professional insights, quotes etc. – think Mark Kurlansky’s Salt or Cod, but a bit more personal. It’s available now for the Kindle here. He’s been a musician since he was a child and coined the term “Jazzfood” to describe his cooking style as “solid technique based upon tasteful improvisational abilities.” He views his food as he does his music and writing and has been known to bust a pout if any of them are subpar in any way.